In a parallel world, one where my life is more than a stuttering series of disappointments, I might well have been in Slovenia watching Hibs tonight. Every cloud and all that. Were Nigel Farage and Richard Littlejohn ever to have a lovechild - and please take as long as you want to mull over that particular image - it’s unlikely that said bairn would manage to have a more fractious relationship with Europe than our SPL clubs are enduring at the moment. We spend ten months of the year squabbling about who is going to get to go on a continental adventure. Then, like the kind of British tourists who stuff their luggage with tins of Heinz All Day Breakfast and Tetley teabags, we discover we absolutely hate it when we get there. To our disgust it’s just like being in a foreign country. Celtic and Hibs played a 4-5-1 formation this week. The intent was obviously to keep things tight and negotiate tricky away games with a minimum of damage. It’s maybe easier to look at Hibs in particular because the team has fewer changes than last season and John Hughes’ longer managerial resume provides a sounder footing for accusations of technical naivete than can yet be made against Neil Lennon. A quick glance at the Hibs team last season would suggest that a defensive 4-5-1 doesn’t suit their strengths. To choose that formation at the expense of both Anthony Stokes and Derek Riordan robs the side of their most potent attacking forces, a problem exacerbated by a five man midfield that always looked like it would struggle to bridge the gap between the men behind the ball and Colin Nish alone up front. Warnings about this were evident throughout the pre season trip to Holland where 4-5-1 hardly proved a resounding success. It seems that not even the cunning ploy of reverting to a 4-4-2 and swapping the officially listed shirt numbers around for the final game was enough to daunt the watching Mirabor scouts. Hibs, of course, have a tendency to be little more than a house built on sand, a team where attacking talent too often provides a bandage for defensive frailties. Even so there must be a way of playing to your strengths in Europe without being too cavalier. A decision to go ultra defensive, apparently borne from fear, is always going to handicap a team like Hibs. When it backfires as spectacularly as it did this evening then the manager has to hold his hands up and admit he got it wrong. Don’t hold your breath for that. It’s the inevitability of results like this that most depresses. 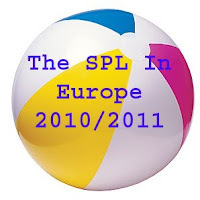 Not only did Hibs’ preparations give tonight’s events a certain predictability but the recent history of Scottish clubs Europe pretty much signposts what’s going to happen. Yes, these games do come early. And that does bring complications especially if, like Celtic, you’re in the process of another major summer overhaul. But Scottish teams have been involved in these July skirmishes for years now. They don’t suddenly get told on the first of the month that they’re going to have start a fortnight before the SPL kicks off. If we still take Europe seriously - and, if nothing else, those blunt 4-5-1s suggest we are still affording the games some respect - we need to sort our preparations out. I’m going to take a punt and suggest that neither Neil Lennon nor John Hughes were Boy Scouts in their youth. Still, no need to be a direct descendant of Baden Powell to understand the importance of being prepared. We’ll still hear that excuse though. Better to build up a barricade and hide behind that than face up to the truth of results that suggest we’re just a bit crap. Unfortunately, unless that simple truth is accepted, it’s difficult to see how it’s going to change. I certainly can’t see how our European results are ever going to improve if we go into games crippled by the belief that our players aren’t ready and that even an approximation of our usual tactics will end up going horribly wrong. It’s like Usain Bolt volunteering to run the 100 metres in a straitjacket. Hibs weren’t beaten by a top European side tonight. Celtic capitulated to a side that, I believe, has undergone even more radical surgery since the end of last season. These are bad results, bad whenever they happen and bad despite a 1000 well rehearsed excuses. Fear, misery and a great big dose of the blame game on the trip home. And thus Scottish football’s awfully big European adventure begins to resemble a particularly bad stag weekend in Blackpool. * Fair play to Motherwell. Absolved from the above rant with an away goal to their name after their 1-1 draw in Norway. A late, late penalty for Aalesund denied them the win. Finely balanced is how you’d describe this one now. But when losing 3-0 seems to be the norm, finely balanced is pretty much the equivalent of winning the World Cup. What do Hibs, Celtic and Heather Mills have in common? The 2nd leg is just for show! @a year in scottish football: I thought that was a bit odd because both legs of Motherwell's last round were on the radio (and maybe TV?) I know the Celtic game won't be televised next week - hopefully the Motherwell game will be though.